Aggressive Class Minesweeper: Laid down, 22 May 1952 at Higgins Inc., New Orleans, LA; Launched, 6 June 1953; Commissioned USS Exultant (AM-441), 31 March 1954; Reclassified as an Ocean Minesweeper, MSO-441, 7 February 1955; Decommissioned, 30 June 1993; Laid up in the Naval Inactive Ship Maintenance Facility, Portsmouth, VA; Struck from the Naval Register, 9 March 1994; Sold for scrap 4 December 2000 to Baltimore Marine Industries, Baltimore, MD. Specifications: Displacement 775 t; Length 172'; Beam 35'; Draft 12'; Speed 14 kts; Complement 78; Armament, as built, one single 40mm gun mount, two .50 cal. machine guns, final configuration, bow gun replaced by one twin 20mm gun mount, two .50 cal. machine guns remain; Propulsion, four Packard ID1700 diesel engines, replaced by four Waukesha Motors Co. diesels, controllable pitch propellers, two shafts. These new minesweepers were smaller and built primarily of wood , with bronze and stainless (non-magnetic) steel fittings to minimize their magnetic signature. 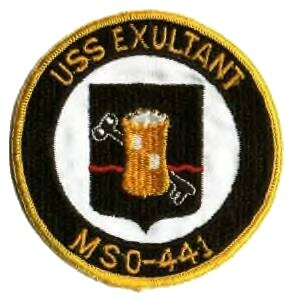 All of the 1950 era MSOs had UQS-1 mine-locating sonar, later updated with SQQ-14 sonar. MSOs were capable of sweeping for moored, bottom contact, magnetic and acoustic mines. WOODEN SHIPS AND IRON MEN a book by CDR David D.Bruhn USN RET. A complete history of our MSO's from 1953 to 1994.To learn more about this excellent minesweeper book please visit CDR Bruhn's website at the link below.